Ohime Mag (left) winning the normal Premier Class race. The photo-finish of the Prix De Vincennes final, yesterday. Okilaibo won yesterday’s top event at the racetrack, the Prix De Vincennes final for Premier trotters over a long distance of 2,640m. The final formed part of the 46th meeting of the year, made up of nine trotting races. Five of the races were finals for French trotters only. Ten horses lined up for the Premier final as before the race got underway two of the contenders, Pedro Vici and Pouloud Kerc’H, were both retired. Power of Love (Michael Ellul) was the fastest at first, opening a half-length’s lead from Okilaibo (Julian Farrugia) and Palazio Valterne (David Ellul). However, with some 300m from the post, Power of Love slowed down its pace and was overtaken by the other front-runners. 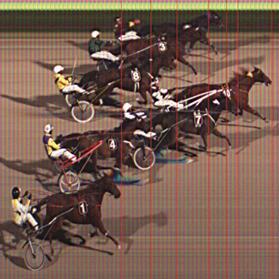 Half-way through the final straight a keen tussle developed between several trotters but it was Okilaibo which went all the way to secure its first win of the season from Palazio Valterne and Quel Noir (Brian Zammit). Original Blue (Chris Cassar) was fourth. After the race, Benoit Fabrega, on behalf of the French association Le Trot, presented the trophy to Farrugia and owner John Seychell. Okilaibo covered the distance in an average time of 1.16” per kilometre. 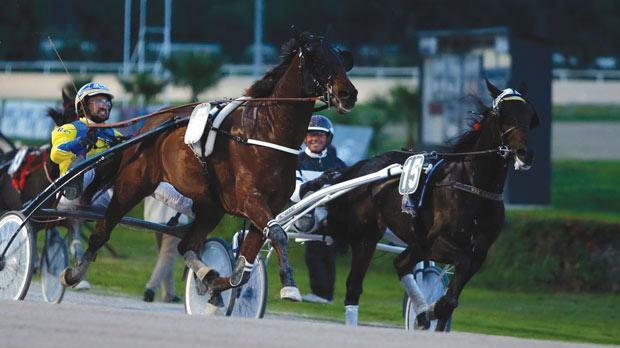 The other four finals were the Prix d’Enghien for Gold trotters, Prix De Cabourg for the Silver category, the Prix De Cagnes Sur Mer for Bronze Class trotters and the Prix De Caen reserved for Copper Class horses. In the Gold final, Rodin Du Rib (Brian Zammit) led all the way and cruised to its second win here some two lengths ahead of Prince Gaillard (Charles Camilleri). Quel Homme (Noel Baldac-chino) and Milord Barbes (Redent Magro) also obtained a good placing in this race. Favourite Record Du Mexique (Marvin Cauchi) was unchallenged in the Silver Class final. This French nine-year-old trotter gained its fourth win in a row with Quazoumax (Andrew Farrugia) second ahead of Quiquafini (Noel Baldacchino) and Poustouf Du Bleuet (David Ellul). Yesterday’s card also included also a normal Premier Class race on a short distance of 2,140m. The early leader, Wee Catch Diamond (Julian Farrugia), was overtaken by Ohime Mag (Ronald Cassar) only a few metres away from the post. Quiet Du Chene (Noel Baldacchino) and Quito Soyer (Brian Zammit) followed behind in that order. For Ohime Mag this was its second win of the season.